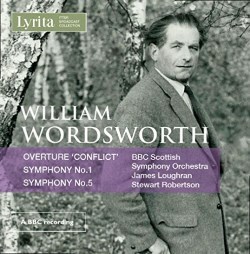 My first encounter with the music of William Wordsworth (1908-1988) was the Piano Sonata, op.13 and the Cheesecombe Suite, op.27, issued during 1975 on a vinyl re-release of the old mono Lyrita record (RCS13) and reissued on CD as Lyrita REAM.2106. It was one of two early recordings from this legendary company I invested in from Harrods' music department in London at that time. The other was an LP of piano music by Franz Reizenstein (RCS19) reissued on CD as Lyrita REAM.2105. Both albums presented music very different to the diet of Vaughan Williams, Elgar and Delius that I was exploring at that time. Over the years, I have discovered a few other pieces by Wordsworth including his String Quartet Op. 30 on an old Discurio LP (DC.001). In 1990, Lyrita released an excellent CD of his Second and Third Symphonies (SRCD.207). It was my first opportunity to listen to a major piece by this composer. Twenty years later, the British Music Society issued a CD (BMS436CD) of cello and piano music featuring Holbrooke, Busch and Wordsworth. It included the latter’s Cello Sonata in G minor, op.66 and the Sonata for violoncello, op.70 (Naxos ~ Naxos ~ BMS). A number of radio broadcasts have been shared by enthusiasts, but these often lack sound quality and are not generally available. The present CD introduces the listener to fine performances of the Symphony No.1 and Symphony No.5 as well as the Overture: Conflict. All three have been culled from Richard Itter’s ‘domestic recordings of BBC transmissions’. At the time, he used state-of-the art disc and tape recorders. As the blurb on the CD explains, ‘he documented his collection, but rarely listened to it, thus preserving it as a pristine archive.’ Devotees of British music would tend to call it a treasure-trove or Aladdin’s Cave rather than an archive. Recent releases from this collection have included important works by Peter Racine Fricker, Arnold Cooke, Phyllis Tate, Ralph Vaughan Williams and Arnold Bax. The Overture: Conflict is new to me. It is surely one of the most dissonant pieces to come from Wordsworth’s pen. The liner-notes (by Paul Conway) remind the listener that it was inspired by the composer’s ‘pacifist convictions and hatred of war’. Conway suggests that it forms a companion piece to Malcolm Arnold’s well-known Peterloo Overture (1967) with its commentary on the 19th century massacre of protesters near St Peter’s Square and the Free Trade Hall in Manchester. Wordsworth’s overture is a satisfying, if somewhat disturbing composition that may have been influenced by the dramatic events in Czechoslovakia in 1968. It was commissioned for the 1969 Guildford Festival and received its first performance there on 16 March of that year. Vernon Handley conducted the Guildford Philharmonic Orchestra. William Wordsworth’s Symphony No.1 in F minor, op.23 was written in 1944: it clearly has ‘overtones of war or spiritual strife’. There are some moments when the tension is relaxed, especially during the beautiful ‘adagio ma non troppo’. This is largely dismissed by the ‘grotesque’ scherzo. Apparently, it has not yet received a public performance, which is unbelievable. Conway suggests that it has been broadcast on a couple of occasions: and that is that. It was premiered during a studio recording in Manchester during 1946 by the BBC Northern Orchestra conducted by Julius Harrison. Jürgen Schaarwächter quotes the composer as admitting that ‘some people liked [the symphony] others thought it dreadful.’ However Wordsworth ‘quite like[d]’ his First and did not choose to ‘disown it altogether’. Thirteen years later, William Wordsworth began writing his Symphony No.5 in A minor, op.68. It would occupy him for three years. Once again the premiere was a radio broadcast rather than a public concert, with Sir Adrian Boult conducting the BBC Northern Symphony Orchestra on a Third Programme concert on 5 October 1962. It is scored for a modest orchestra but with a considerable array of percussion. The liner-notes describe the logic of the symphony as ‘each of the three movements being dominated by one aspect – thematic, rhythmic or harmonic – of the strong theme which thrusts upwards on cellos and basses at the outset.’ This is elaborated in a gloomy, but sometimes utterly beautiful opening ‘andante maestoso’, another disturbing ‘scherzo’ and an aggressive last movement. Deryck Cooke is quoted (Listener, 4 July 1963) as saying that this ‘is a bold and fully-organised symphonic drama, whose whole structure arises naturally from its questing initial theme … [it] carries complete conviction.’ Once again, it beggars belief that this striking essay is not in the repertoire. I agree with Michael Kennedy’s view (Listener 23 June 1963) that this is the composer’s ‘finest work to date’. In fact, bearing in mind the relative paucity of available recordings of Wordsworth’s music, I contend that it may well be his masterpiece. As with all these CDs in the Itter Broadcast Collection the presentation is excellent. The liner-note by Paul Conway is comprehensive and gives a brief history of the composer as well as a detailed discussion of each work. The re-mastering of the sound is excellent. Included in William Wordsworth’s catalogue are eight symphonies, three concertos and a large quantity of chamber music. We now have 1, 2, 3 and 5 on CD. I hope that the remainder can be issued as soon as possible. Although I fully appreciate and laud the present release of these broadcasts, one can only hope that some day an enterprising and bold CD produced will make a brand new cycle (complete) of these impressive symphonies.